Marcus Henderson, best known for performing the guitar parts in the mega hit video game series Guitar Hero, joins forces with Epiphone to create the new Apparition signature guitar. 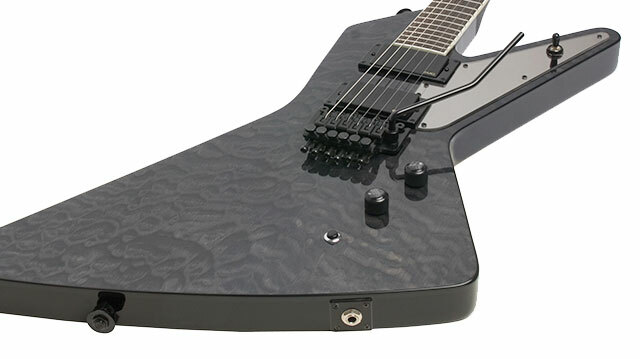 With a shape reminiscent of an Explorer or Futura, the new Apparition takes guitar design to the extreme with sharper angles, a unique "patent-applied-for" All-Access™ heel contour, and high-performance pickups, controls, and hardware for an axe that's perfect for every guitar hero. 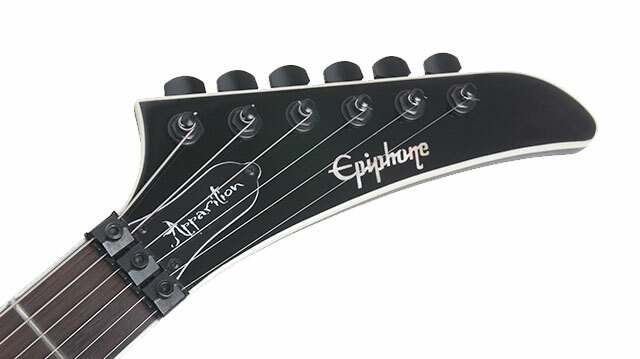 The Apparition comes with Epiphone’s Limited Lifetime Warranty and Gibson 24/7/365 Customer Service. Marcus Henderson’s Apparition is ready to take you to a whole new world. Are you ready? The Apparition has a solid mahogany body topped with a highly figured, hand-stained Quilt maple finish. The solid 24.75" scale mahogany neck is glued-in for great sustain and solid intonation. Adding to the Apparition's playing speed and comfort is Epiphone’s SpeedTaper™ satin finish neck. Originally designed for the Prophecy collection, this U-shaped neck profile allows for blistering guitar riffs with minimal fatigue. Both the neck and the six-on-a-side headstock are bound to create a smooth and finished appearance. 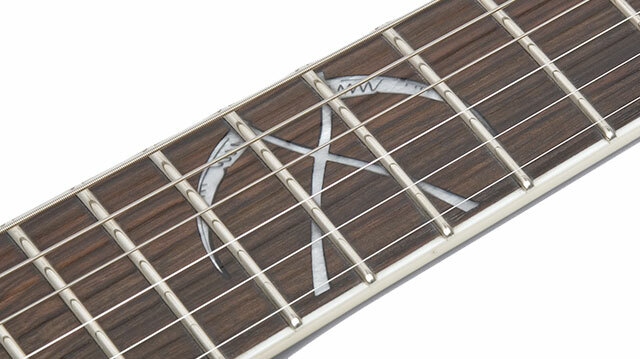 The Apparition's ebony fingerboard has a 14” radius and 24 jumbo nickel/silver alloy frets and pearloid Crossed Scythes at the 12th-fret with a double action 2-way truss rod. The Midnight ebony finish gives the Apparition a beautiful and mysterious ghostly look. All great guitars build their reputation on tone and that’s where the Apparition really makes waves with an active set of EMG humbuckers including an EMG-81 pickup in the bridge position and an EMG-85 in the neck position. With a distinctive tone capable of high output levels with zero noise, EMG pickups are ideally suited for high-volume hard rock and metal. Controls include a Master Volume and Master Tone with a 3-way pickup selector. For the first time ever, our momentary, spring-loaded KillSwitch comes standard, allowing players to create amazing effects, particularly in combination with the tremolo. To allow Marcus and all other guitar warriors complete and easy access to all of the Apparition's 24 nickel/silver jumbo frets, Epiphone engineers came up with a new All-Access™ heel design. Featuring a carved-out flat area that extends well past the heel and a glued-in neck joint, this design makes playing high up the neck effortless. The glued-in All-Access heel™ also creates a deep rich tone with excellent sustain. 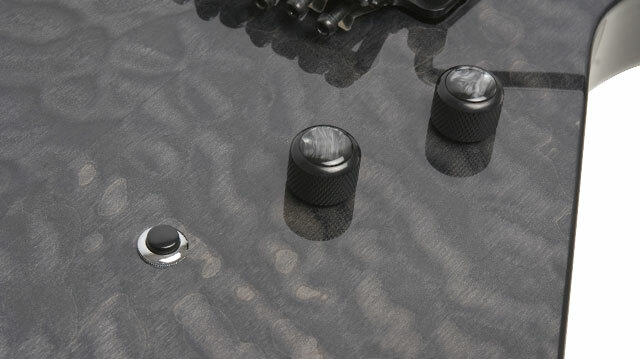 With the Apparition’s double-locking Floyd Rose™ tremolo and a special designed tremolo cavity, pitch can be lowered or raised with excellent return-to-pitch accuracy. Epiphone's new "patent-applied-for" StrapLocks are included with every Apparition so you can be sure that this guitar will not fly off the strap even under the most extreme performance conditions. The Apparition’s premium die-cast tuners also ensure stable tuning and intonation.